A Canadian science fiction writer is abducted by a UFO from the streets of Victoria, British Columbia. The world shrugs and dismisses it as a social media hoax. Days later, mysterious forcefields start appearing around wilderness areas in danger of human encroachment. Fracking sites are cut off, animal migratory routes disrupted by human civilisation restored and fishing boats are unable to cast their nets. Then people find themselves being forcibly prevented from hurting one another. An Intervention has taken place. Steven Erikson is best-known in genre circles for his Malazan Book of the Fallen fantasy sequence, consisting of ten brick-thick novels packed with battles, sorcery, comedy, tragedy, drama and musings on compassion, morality and ethics. The Malazan series is both an epic fantasy and an inverted interrogation of epic fantasy. His forays outside the field into science fiction have been less noteworthy, consisting of three Star Trek pastiches and a post-apocalyptic novella. 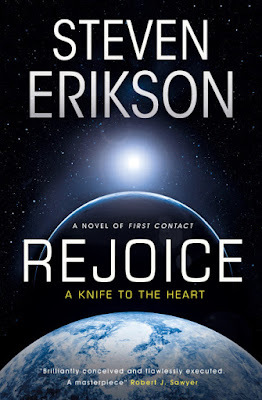 Rejoice, a Knife to the Heart is therefore his first serious, full-length science fiction novel and it's probably going to take people by surprise. It's relatively short (400 pages of quite large type), focused and a bit of a throwback to SF's golden age, consisting of story development through sequences of conversations between core characters. It feels like something Clarke or Asimov would have written in the 1950s, except with far superior character development. Integral to the story is the fact that people can no longer hurt or kill one another, which means that the good old genre stand-bys - shoot-outs, nukes, battles, chases, character deaths - are unavailable to the author. This feels like a challenge Erikson has set out to himself and he meets with relish. The wit and erudition of the Malazan series is still present here, but seriously pared back to more human and witty levels. 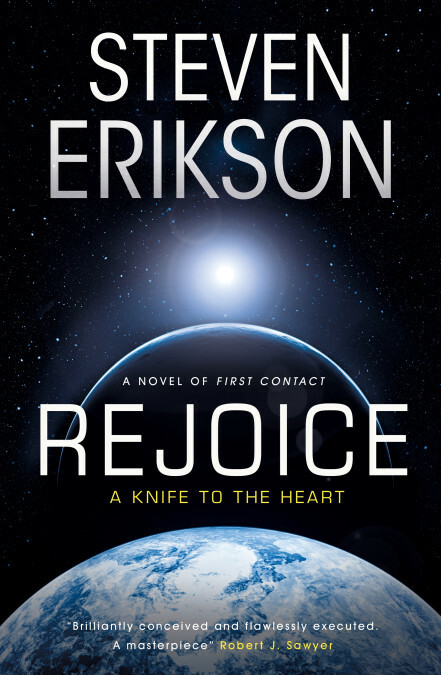 Rejoice, a Knife to the Heart is, surprisingly, Erikson's most approachable and accessible novel to date. It's a novel that asks big questions about the future of humanity and what our fate will be, self-destruction (either in war or from societal collapse resulting from environmental disaster, dwindling resources or simple exhaustion of the human spirit) or enlightenment, discovering means of abolishing scarcity and moving into a truly utopian existence, and how that will impact on a species conditioned by centuries of exposure to free-market capitalism. To that end, those expecting "Malazan, but in space," (at least in terms of sheer scale) will be disappointed. But those up for a stimulating, question-raising, intelligent SF novel which explores ideas of scarcity, postcapitalism, paradigm shifts, fake news, populism, climate change, Big Dumb Objects and environmentalism, all done in a concise manner, this book is for you. Challenges abound in the novel, most notably how to build tension when it's literally impossible to have any kind of military confrontation or action resulting in injury or death. Erikson does this with a great philosophical debate: the mysterious aliens spare humanity for a specific reason, because there's something we can do they cannot, and this central mystery is gently teased out over the course of the book in a manner that's compelling. It's also not quite resolved in the space of this one novel: sequels are not strictly necessary, but would be welcome to explore some of the mysteries left unexplained in this book. This is also a novel which may be tapping SF's golden age, but it's also a very timely novel. There's nods to the #metoo movement and almost all of the movers and shakers in the story are based on real people. It's pretty obvious which US President the fictional one is based on, and spotting the fictional equivalents of the Koch Brothers, Elon Musk and Rupert Murdoch is amusing. The book also has a very human side, and the key theme of the Malazan series - compassion and empathy - rears its head here as well. There's also a few touching tributes to SF authors who have passed away in the novel, which may make a few lower lips quiver. Rejoice, a Knife to the Heart (****) is going to be a divisive book, I feel. I suspect some will be bored by a novel which consists almost entirely of conversations between people without a laser gun battle in sight (there are a couple of small explosions though), but for those who read SF for ideas, for intelligent observations on the world around us and explorations of what humanity could be if it could throw off the shackles of inequality and exploitation, this is a fascinating work. It will be published in the UK and USA on 18 October 2018. Sounds like a leftist polemic to me. Unfortunately, not surprising after having been subjected to the odd segment of such in the Malazan series. Not sure if I could stomach an entire book of it. What was the post-apocalyptic novella he wrote? I preordered the audiobook on Audible, and just got an e-mail that my order was cancelled, and the release on Audible was delayed indefinitely. Any thoughts on why this might have happened? Sounds awesome, can't wait to read it. Saying women shouldn't get raped is now a 'leftist polemic.' And here we are. I for one welcome our new alien overlords. What Jon Kanders said. Unfortunately they won't and Jello Donut and his brethren will be standing in the crumbling ruins calling the destruction of the world a conspiracy of the left/queer/latino/whatever community. Thus ends the world, not with a bang, nor a whimper but rather with the confused, piglike grunt man who thought he was owed everything. I was hoping for "Malazan in space" and did end up disappointed. Erikson asks complex questions, but answers them through the removal of scarcity, which isn't an interesting answer. "Develop cold fusion" is a great solution to many of the world's ills (along with "somehow magically prevent violence"), but feels like Utopian dreaming. I didn't realize the challenges of writing conflict/tension without violence though. I appreciate you pointing that out.